As I write we are 19 days away from the Vintage Parkway harvest carnival. This is the first time in 4 years the haunt frame is built and plastic is already hung. In fact I am so far ahead decorating has already been going on for 3 days! Thankfully school administration allowed me access to the stage when the kids were dismissed for fall break. Construction began bright and early on Monday, October 3 with our target date for the harvest carnival 25 days away. 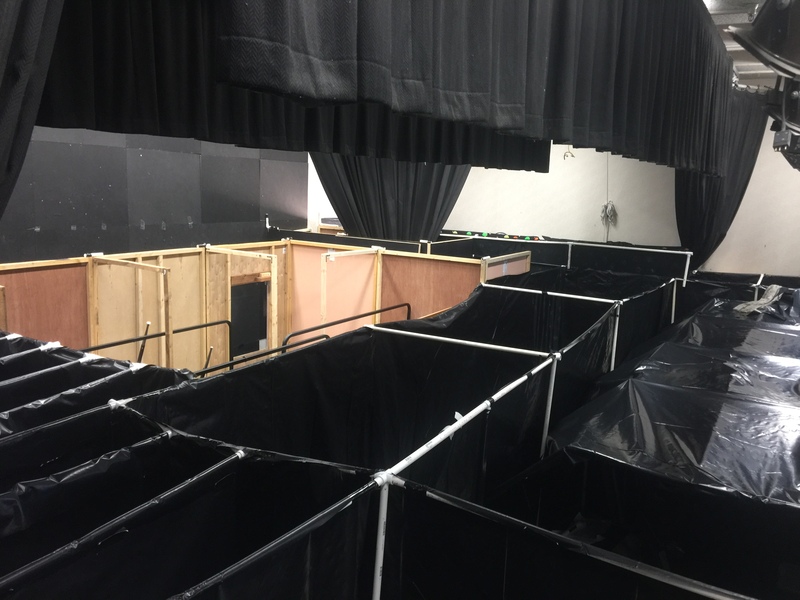 Prior to starting the building, I had walked the staged and taped off the hallways and room to make sure what I designed on paper translate could be accomplished. After 3 years of building, I knew what would work and what wouldn’t. As I stepped back, smiling, a sense of accomplishment fall over me. “It fits!” I walked through the hallways and rooms with my imagination playing a key roll to the look and feel of the haunt. There were a few concerns but those would be addressed once the construction began. With plans in hand and Pandora blaring on my mobile device I began shifting chairs, tables, white board that were being stored on the stage. My 24’x34′ canvas needed to be clean before I could commence with the building. Once I had stuff where it would eventually end up, PVC pipe was laid out. Having invested heavily the first 2 years in PVC pipe, I had all the necessary pieces I needed and was not anticipating purchasing any more. 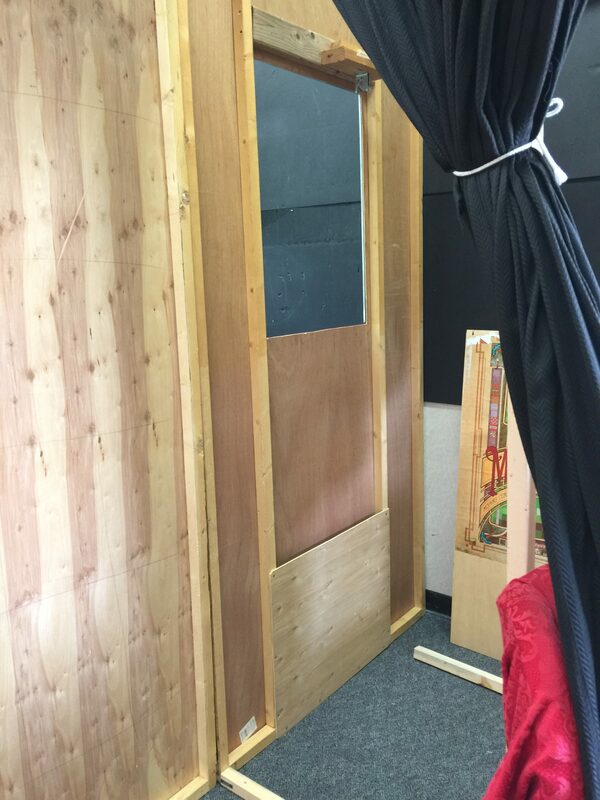 In fact with the eleven, 4’x’8′ wood wall panels, construction went but a bit quicker. The last 2 years I had planned storage areas, but the implementation failed. Those areas were reduced in size and unable to accommodate as a storage area. 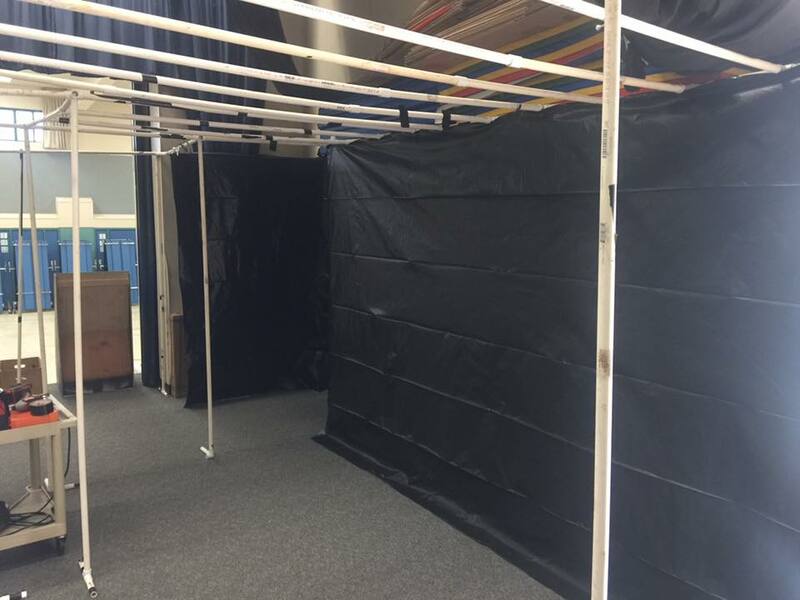 Thanks to precise planning chairs were stacked down the first hallway in a 2′ wide corridor behind the black plastic. 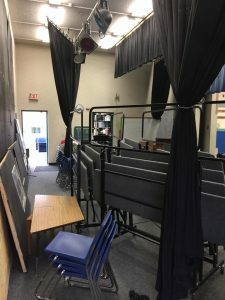 I even had enough room for the school piano. This was also the first year I built the haunt with the stage curtain open to the auditorium. Didn’t think that would make a difference, but it allowed me access to areas I couldn’t get to easily, it also provided more light, which was something I always needed. In the middle of the haunt I designed an 8’x12′ area behind our wood wall panel hallway. This area would allow me enough room to house three of the four portable risers, along with two chalk boards. The fourth riser would be stashed in the PTA closet. This is the first year the drop panels won’t be situated across from each other. The hallway zigs to the left, then left again. One drop window will behind guests when they turn down the hallway, the other on the left. Not sure if this will work. Again, we have an issues with timing the drop windows. How do the actors know when to drop the panels to scare the guests? Mirrors? A video camera? A mobile device streaming? I’ve some ideas, but nothing confirmed…yet. 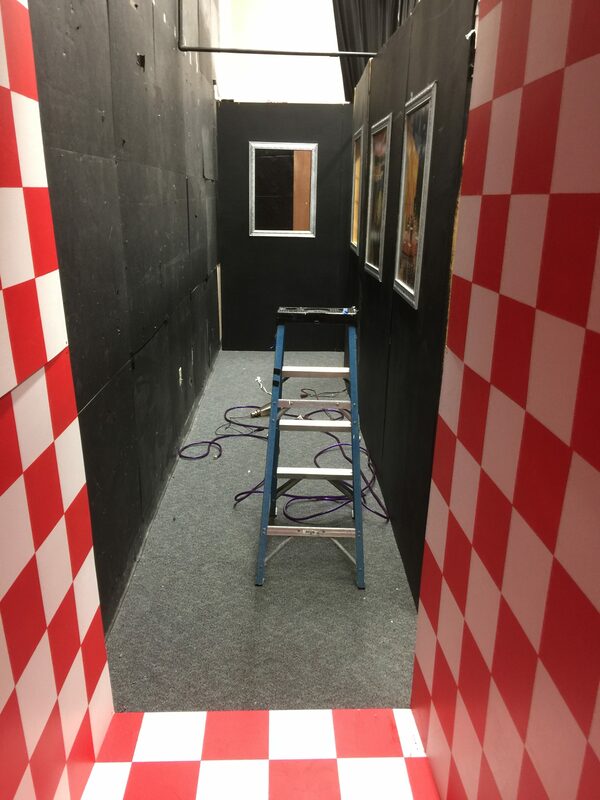 While most of the building is finished, I still need to piece together a 4’x6′ box that will be painted as a red/white checkerboard. 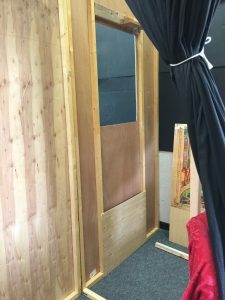 This will be used as a false exit at the end of the drop panel hallway, prior to entering the final two rooms of the haunt. The area has been measured and awaits construction and paint. While I had not anticipated purchasing any more PVC, I have decided to build a 4’x7′ box in front of the entrance, leading onto the stage. There will be 3 queues for groups to wait their turn in, which should provide for better guest management. What I didn’t estimate properly was the amount of visqueen required. The entrance box left a bit to be desired when it was finally implemented. I wasn’t happy with how it turned out, but with hours to go before the doors opened, I had no options but to run with it half finished. I brought back the laser vortex for the second year, positioned in the same area of the stage as last year, encompassing 7’x20′ area. After the PVC was connected and plastic hung, I didn’t realize I would run into an issue with the construction of the vortex hallway. It required me to cut the tape off and break down a few walls that all happened to intersect at the same point in the haunt. I spent about 2 hours breaking down and rebuilding this area to make it function properly. In the end, the area didn’t turn out as expected and it left me frustrated. However, with the rebuild, the junction was stronger than previously built. 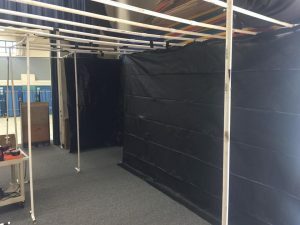 At the end of the vortex hallway, two turns to the right and you walked down a 16′ long, 5′ wide hallway that would having hanging body bags to navigate through. Two problems I ran into, first the horizontal PVC pipe I ran across the top of the hallway to hang the body bags on were not strong enough and sagged. Second, the walls also sagged, as I did not put vertical wall support close enough together to support this extra weight. While I started with enough time to put together the best haunt Vintage Parkway had seen, I ran into some time constraints the last week or so before the carnival was to take place. The drop window hallways functioned, but not how I had envisioned. 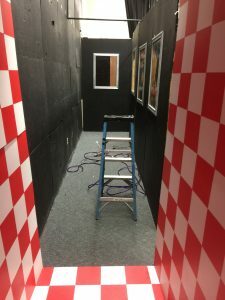 Exiting the hallway, walking through hanging plastic you entered a red and white checkered room built of 5mm plywood on the back of 2″x4″ supports. I planned this room after seeing an image on Pinterest. Little did I know just how long it would take to tape and paint these sheets of plywood. When I started building this room I realized I should have painted this with a vertical construction in mind, not a horizontal. This left the walls very unstable when I finally got the room built. A few extra screws in the floor, walls and some added supports ensured the room would not fall down. The final room was one of the largest, but simplest rooms in the haunt. It was something I had been planning on doing the past few years, but never followed through. The room was 15’x7′ and set every one foot was PVC pipe spanning the top of the room. Black plastic was hung on each 7′ support. Once hung, the plastic was sliced vertically, required guests to swim through the room with their arms in search of the exit. I planned well, but didn’t follow through. Some of the PVC spanning the room was too short and continually fell, without any extra PVC, it was all I could do it keep reconnecting the pipe and using a mallet pound them together. The exit was another Pinterest room I found using shipping pallets. While I didn’t have much in the way of fluorescent paint, I attempted to using white, yellow, pink, orange and green with a black light shining down on the room. In between the slats of the pallets I placed colored masks looking at guests as they exited the haunt.